was born on January 20, 1909, in Miyakonojou, Shonai, Miyazaki Prefecture near Kagoshima city on the Island of Kyushu Japan. Grandmaster Gogen Yamaguchi Hanshi travelled to Australia on two occasions, 1970 & 1972. During both visits he stayed at the home of Paul Starling Shihan's parents in Sydney. The Goju Kai members from Sydney, and Victorian, hold precious memories of training in the presence of Yamaguchi Kaiso, and many hundreds of Australian members have since taken the opportunity to train in his Hombu Dojo in Suginami Ku in Tokyo. Paul Starling Shihan was the first graduate as Shihan of Gogen Sensei's prestigious Nihon Karate do Senmon Gakko, Japan Karate do College, whereby Grandmasters Inoue Motokatsu- Ryukyu Kobujitsu, Ohtsuka Hironori-Wado Ryu , and Tamae Sensei-Rembukan, as well as Iwata Manzao-Shito Ryu , all taught regularly along side Yamaguchi Gogen Hanshi and his son Yamaguchi Goshi Shihan. Goju Kai practitioners throughout the world mourned the passing of Gogen Yamaguchi Kaiso in 1989. He had been married twice, firstly to Midori and secondly to Mitsue, and had five children: Gosei Norimi Yamaguchi; Gosen Kishio Yamaguchi; Makiko Yamaguchi; Goshi Hiroufumi Yamaguchi; Makiko Yamaguchi and Gokyoko Wakako Yamaguchi. All of his children practiced Karate do. Gosei Shihan has his own organisation in the United states of America and Goshi Shihan is the President of the International Karate do Goju Kai with branches in 60 countries. Gosen Shihan passed away recently and was fully involved in the running of the IKGA. Wakako Shihan was an All Japan Kata Champion and like her brothers a dedicated and inspirational instructor. Makiko Yamaguchi passed away in the 1980's . As a child the young Jitsumi showed great interest in the martial arts. During his early school days when he was thirteen years of age, he studied Goju-Ryu Karate Kempo with his instructor named Takeo Maruyama, he also trained in kendo, (Japanese fencing) and it was during this time that he started his karate training under the tutelage of Mr. Maruta, a carpenter from Okinawa. Mr. Maruta who was a Goju practitioner, was drawn to the youngsters serious attitude and his willingness to train hard. Mr. Maruta taught Gogen Yamaguchi all he knew about the Goju system. Gogen Yamaguchi was named Jitsumi Yamaguchi at his birth his father Tokutaro Yamaguchi was a merchant and later a schoolteacher and Superintendent, his mother Yoshimatsu was his father's assistant. Jitsumi was the couples 3rd son. There were 11 children in the family altogether. Gogen Yamaguchi was also known in the world of Karate as ‘the Cat’. He was a small man, just over five feet and a mere 160 pounds, however he projected the impression of great bulk and solemnity and was first dubbed “the Cat” by American GI’s for his gliding walk and flowing hair. He alone is primarily responsible for the spread of Goju Ryu in the world today. Before training in Karate he studied Kendo (Japanese fencing). His first taste of Goju Ryu Karate-do however wasn't until his large family moved to Kyoto while he was in his teens that he began the serious study of Karate do with Sensei Takeo Maruta at the Maruta Dojo in Miyazai Kyushu. Mr. Takeo Maruta was a carpenter by trade and student of Chojun Miyagi. Mr. Yamaguchi later studied directly with Mr. Miyagi in 1929 after he and his then current teacher and friend Jitsuei Yogi wrote in 1929 to Chojun Miyagi and invited him to come to Japan. In 1929 Gogen Yamaguchi invited Mr. Miyagi to visit Japan, and, after a long wait he was introduced to Chojun Miyagi by Jitsuei Yogi (September 27, 1912 - November 1997). Chojun Miyagi visited Japan,to the schools of Kansai, Osaka, Ritsumei, Kyoto, and Doshisha Universities, while Gogen attended Ritsumei Kan UnivLersity. There he studied Law and of course in 1930 Sensei Yogi, together with Gogen Yamaguchi as the primary, co-founded the Ritsumei-Kan Dai-Gaku Karate Kenkyu Kai, the first Karate club at Ritsumei-Kan University. The Ritsumei-Kan Karate-do Kenkyu Kai was the first University Karate club in western Japan and was infamous for its hard style training and fierce Karate fighters. Both Yogi and Yamaguchi attended Ritsumei-Kan University during the time Chojun Miyagi visited, and Chojun Miyagi stayed in Sensei Yogi’s apartment. 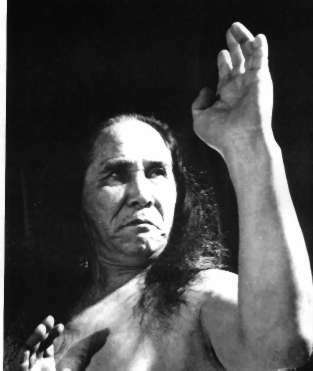 Until his death, Yogi was a close friend and advisor to Morio Higaonna and the IOGKF. Chojun Miyagi later named Gogen Yamaguchi the leader of the Goju Ryu on mainland Japan. In the early 1930’s Mr. Yamaguchi sketched out what would become the legendary signature Goju Ryu fist. It is modeled after the right hand fist of Chojun Miyagi. After graduating from the Ritsumei Kan University in Kyoto (1934),that same year Yamaguchi Sensei invented Jiyu-Kumite which has become known today as sport and tournament Kumite. In 1935 he officially formed the All Japan Goju Kai Karate-Do Association (now today’s I.K.G.A.). Also in 1935: Mr. Yamaguchi began his travels with the Japanese Government as an intelligence officer and the first son of Mr. Yamaguchi (Norimi Gosei Yamaguchi) was born (June 25th, 1935). 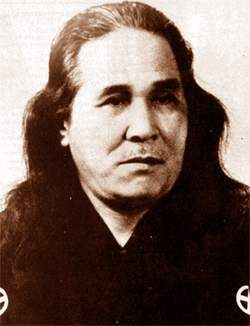 During his military tour in Manchuria Gogen Yamaguchi was seized by the Russian military (1942) and this was the year that his youngest son Hirofumi Goshi was born; and so the fabled tales begin of Gogen Yamaguchi’s infamous time in the Russian Concentration camp and the battle and defeat of a live Tiger. Gogen Yamaguchi had been slated for hard labor in the Russian POW camp. However he had impressed even his Russian captors. When they found out who he was, they had him give Karate lessons to the Russian troops. And so the captive became the master of the captors, who became his students. Mr. Gogen Yamaguchi established Goju-Kai Headquarters in Tokyo Japan next to the legendary Giho-Kai Judo Institute. Shihan Yamaguchi effectively had Goju-Ryu formally registered into the Butoku-Kai, the official governing body and ‘Government’ Headquarters for the Japanese Martial Arts, similar to the American Pentagon. MIDORI YAMAGUCHI- A calm, sensitive person, Midori Yamaguchi displayed the quiet strength and strong will , a characteristic for which she is reknown. Many have said that if Gogen Yamaguchi hadn't had Midori at his side during all these years he wouldn't have been able to organize his system. Some students have felt greater affection for Midori Yamaguchi than for the Gogen Yamaguchi. During the years of vigorous training at the height of Goju Ryu Kai’s influence Midori Yamaguchi played the part of a virtual Dojo Mother. Mr. Yamaguchi was actually awarded his rank of Renshi in 1940 although not returning to Japan for residency until 1945. In 1950 Goju-Kai Headquarters was officially relocated to Tokyo Japan which contributed to an almost triple in membership to 450,000. Five years later he officially chartered the I.K.G.A. Later in 1964 Mr. Yamaguchi unified all the Karate Dojo in Japan to form the All Japan Karate Federation which is still in existence today as the Japan Karate Federation (JKF). Prior to his death in 1989 , he was decorated by the Emperor of Japan in 1968 with the Ranju-Hosho (Blue Ribbon Medal) and the fifth order of merit for his contribution to the martial arts. Yamaguchi Sensei produced and distributed a short film on training in Taikgyo or Waterfall training. In the winter of 1965, the outdoor excursion was held on the slopes of Mt. Nagano Ontake. (Please see our video pages if you would like to view a copy) Each day started off with Sensei Yamaguchi and his followers pouring ice water over themselves and this was filmed during one of his mountainside excursions in the dead of winter heading a group of followers, without shoes and clad only in a thin Gi. This ‘waterfall’ training involves practicing the Kihon Gata Sanchin and or Tensho as well as Sanchin Tensho, utilizing the Yo and In practice of Ibuki breathing. The power of the water fall forced the performers to maintain themselves in that position and when the film was mass distributed it marked the image of Goju Ryu Kai practitioners as being close to invincible and this reinforced that reputation. Dojo and clubs and 600,000 members claimed for the Goju Ryu system. Before passing away of natural causes in 1989 Yoshimi Gogen Yamaguchi had trained as a Lawyer, Military officer, and was said to have been a highly decorated war hero. He was a Shinto priest, and an influential Yoga Practitioner (aligning the significance of Karate Do to that of Yoga) He was at the same time a Karate Master, a father and Husband. He studied Law at Kansei University in 1928 and Ritsumeikan University from 1929 to 1937 and received Law Degrees according to his son, Norimi Yamaguchi. During his University days as a Law student, Yamaguchi Kaiso had established his first Karate do Dojo at the Ritsumeikan University in Kyoto. Soon the dojo became famous in the city, known for its hard training and fierce breathing exercise. In those days students of karate do practised only kata (formal movements) and yakusoku kumite (prearranged sparring) and were unable to have matches between each other since they always fought with full contact and did not hold back their techniques. It was during this period that Gogen Yamaguchi Sensei created the first stages towards what is known as jiyu kumite (free fighting), and established rules to decide the winner of a match. Some of the rules are still in use today in what is known as sport or competition karate. 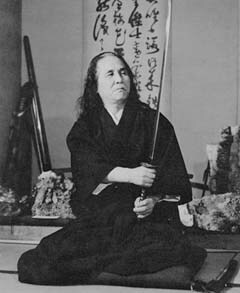 As mentioned above herein it was during 1931, at the age of 22 that Gogen Yamaguchi Sensei had been introduced to the founder of the Goju style, - Master Chojun Miyagi. This meeting proved to have a profound affect upon Sensei Yamaguchi's outlook on karate. Previously he had only considered the hard aspect of Goju but after his meeting with Master Miyagi he was determined to train himself spiritually as well as physically. Master Miyagi thought highly of his new student who seemed to have mastered the hard aspect of Goju so well and gave him the nickname Gogen, meaning "Rough". He then appointed Gogen Yamaguchi as his successor of the Goju school in Japan. During the years to follow, Gogen Yamaguchi Sensei often spent long stays at Mount Kurama where he subjected himself to ascetic exercises and hard training with Sanchin, meditation, and fasting. Between 1938-1945 he was sent to Manchuria on government and military assignments. On several occasions during his stay there, he attributed his skills in karate and his mental training for the fact that he had remained alive. During the Japanese-Russian war, Gogen Yamaguchi was taken prisoner of war and sent to the prison camp in Mongolia where he was kept under harsh conditions for two years. Once again his strength and skill were severely put to the test. During all these years he still continued to train and develop Goju karate. Master Yamaguchi's contributions to Goju Ryu karate do and to karate do in general have been enormous. Under his leadership the International Karate-do Goju-Kai Association (I.K.G.A) has emerged. The organization has increased in popularity both in Japan and other Asian and Western countries around the world. Today there are about 60-70 countries teaching Goju-Kai karate. Master Yamaguchi succeeded in uniting all the karate schools in Japan into a single union which resulted in the formation of The Federation of All Japan Karate-do Organization (F.A.J.K.O.) in 1964. The Kokusai Budo Renmei - (The International Martial Arts Federation) in Japan, whose chairman is Prince Higashikuni of the Japanese Imperial Family appointed Master Yamaguchi as Shihan (Master) of the organizations karate division. He added to the Goju system the Taikyoku Kata forms, - training methods for the beginner students to prepare them for the more advanced kata. In combining his religious practices with karate do training, he incorporated both Yoga and Shinto into Goju-Kai karate do and founded in recent years Goju-Shinto. He stated that both body and mind are interrelated and through proper breathing and concentration the Karate ka will be able to understand the essence of the martial arts. This is the reason why the Goju school uses the unique breathing exercise called ibuki. Concentrating all the muscular strength at one point, bringing mind and body into a coherent whole. Some have argued that 'Never before has a single man had such profound effect on the development and propagation of karate-do.' Master Gogen Yamaguchi, 10th Dan (level), was a man of intense dedication and determination can truly be called a karate legend. A master of Yoga and a Shinto priest, a man that truly has united both aspects of go and ju into a concerted union.